Our mission is to provide incredible, unique vacations with experiences to cherish for a lifetime. From personal trips designed specifically for couples and families, to planned tours and vacations bringing groups together, we craft perfect itineraries for all activity levels, budgets and special interests. From Luxury Galapagos Packages to Budget Adventure Tours, owners Sarah and Robert tailor each trip to exactly what you're looking for. They personally lead tours and work with trusted partners to ensure each guest is cared for like a longtime friend. They take great care to build relationships with local communities for lasting, sustainable travel opportunities. Mountain Views Inn originally started as a beautiful Bed and Breakfast in the Andean heartland of Ecuador by founder Robert Fernandez. Robert's family moved from Ecuador to New York just before he was born. After a successful career in Mechanical Engineering, Robert decided to change gears to pursue his two passions - Tennis and Travel. Since 2007 he has shared his love of Ecuador through Adventure and Yoga tours, personally guiding guests to the best sites and experiences of Ecuador and the Galapagos Islands. The New Year's Eve Adventure caught Sarah's eye in 2012. She fell in love with Ecuador and Robert. While balancing a career in Automotive Engineering, she started leading adventure tours and creating Galapagos tours with Robert. In 2016 they married in an epic destination wedding at the Middle of the World. She's said goodbye to Engineering to devote her time to Travel and Yoga, creating the best vacation experiences for memories to last a lifetime. 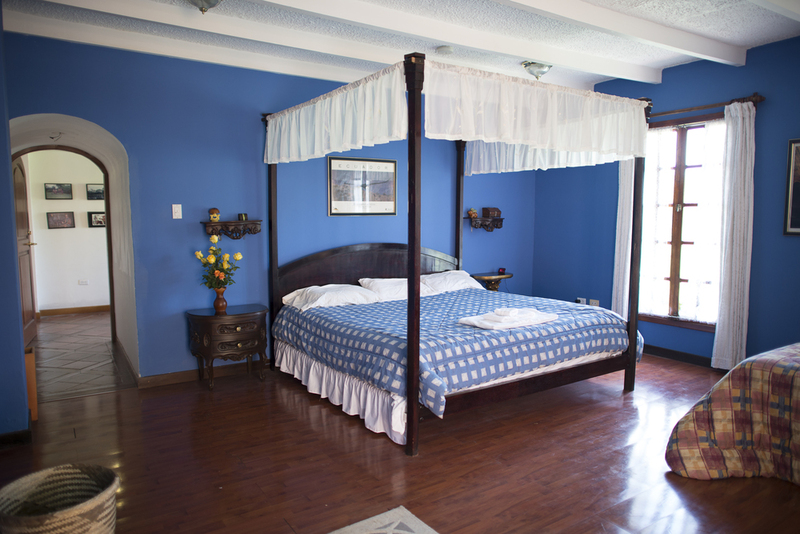 For small groups, accommodations can be arranged at our beautiful Bed and Breakfast in the safe, warm Valley of Tumbaco, just outside the busy capital city of Quito. Mountain Views Inn Accommodations include individually decorated rooms designed for your comfort with soft furnishings, hand carved furniture, and local art. Up to 20 guests can reside in 15 rooms ranging from twin, queen and king sized rooms. Sleep in a comfy orthopedic bed while be awaken by humming birds in the morning. Sleep tight. Life along the Equator offers an incredible selection of fresh vegetables and exotic fruits. Meals may fluctuate per the itinerary and seasonal availability. Vegetarian, Vegan and other dietary requirements can be easily accommodated. Please notify Info@EcuadorMVI.com with any allergy or dietary needs. Breakfast will feature a different fresh juice daily, including exotic flavors like Guanabana and Naranjilla. You'll also enjoy a rejuvenating selection of fruit, bread, yogurt and granola, eggs, and coffee or tea. Typical lunches will include sandwiches, tamales, corn, chochos, tostado, fava beans, with snacks and fruit available throughout the day. Ecuadorian soups are a special treat, and usually the first plate for dinner. Favorites include: quinoa, potato and avocado, green ball plantain with cabbage, chicken soup, cream of tomato, mushroom and asparagus. Main Dishes will include traditional proteins like chicken, ground beef, pork, fish and shrimp, with delicious sides such as potato, indigenous corn, white carrot puree, beets, rice, potato pancakes, fava beans, mote, pasta and plantains.